Extreme Outdoor sports in canada, originally uploaded by Mic2006. Though many would consider caving to be an extreme outdoor sport, I believe that there are few experiences that have the soul baring qualities of first time exploration of virgin tunnels. Though there are plenty of opportunities for exploring such passasges in western Canada – in the gargantuan shafts and passages of the Rockies, Ontario has remained somewhat unrecognized for its wild caving potential. 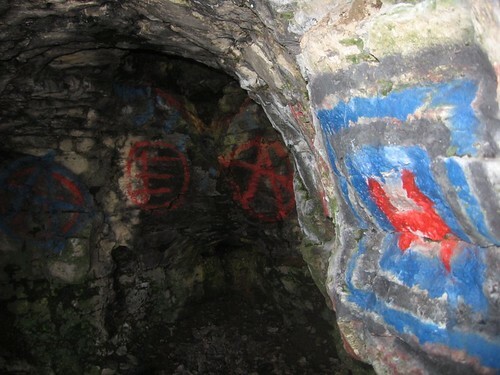 As it has recently become apparent, there are plenty of opportunities for cave exploration near Toronto. 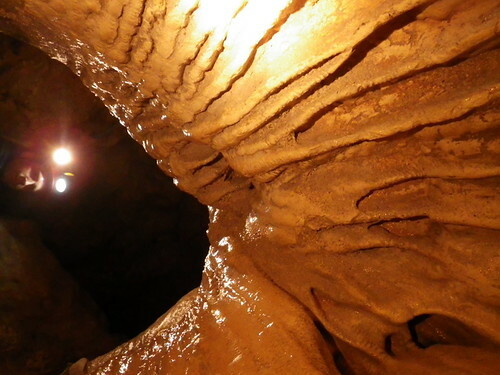 Parts of Ontario are honeycombed beneath by cave passages that have never been seen before. Check out this video from our exploration of some passages that we are in the process of opening somewhere near Toronto – see video on Extreme Outdoor sports near Toronto here. Buried Alive! 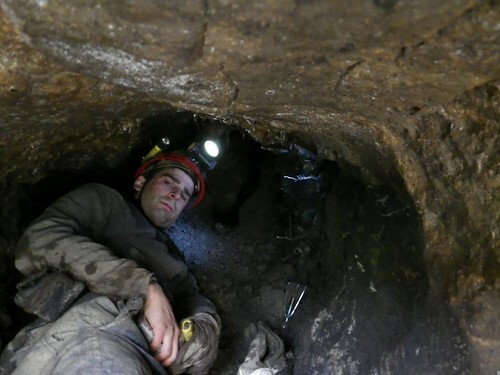 – Extreme Caving in Ontario, originally uploaded by Mic2006. Greetings cavers and cave interested readers. 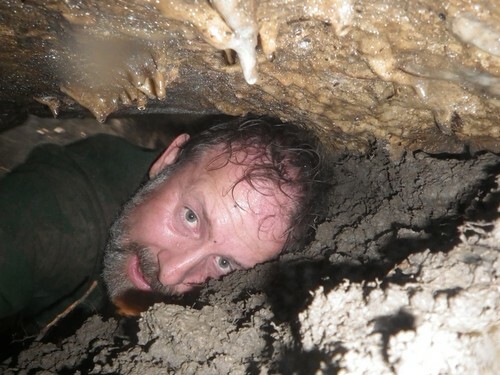 As you might have gathered by the photo, I have spent some time underground today in the solitary and yet thought provoking pursuit of extreme cave digging. Admittedly there were times when it felt like I was buried alive and there were also the issues of trying to squeeze back out of the hole by which I had entered this tunnel. JC and I have delayed a return to the shafts that we found last weekend (so as not to bother the land owner too much) and instead we investigated another lead. Somewhere near that lead we found a blind valley and in clearing the sticks and leaves away we found a pheratic tube that is choked with yellow clay. As I was digging there was plenty of time for reflection and I came up with the thought that this tube must have drained the lake that we think must have existed in the hollow of a nearby field. Although the field is in an area of highly developed karst, it’s contact with the rock is sealed by this clay and so not surprisingly the drainage points are limited to a few locations – this is one of them. again, this geographic situation is similar to the geography of the cave system that we found in Hamilton last year – Wasteland Waterway (Consider this when looking for caves in Ontario). We are still unsure of when the cave tunnels were choked (glacial or at the initial clearance of the land), but it must have been some time ago as calcite has dripped down onto the surface of the fill and formed a solid scab in places. Obviously our excavations have to be very carefully performed as we do not want to damage speleothems. The tube appears to be elliptical in shape and the formations fill the airspace between the clay choke and the roof. whatever we excavate will be our crawlspace. Caves on the Bruce Peninsula – Beneath the Niagara Escarpment, originally uploaded by Mic2006. This is a shaft at the back of a well known sea cave on the Bruce Peninsula. It might appear that I am desperately fighting a giant serpent that is in the process of swallowing me. Well gravity is on it’s side and I slid quite easily down its throat. This particular weekend was a very successful one for caving in that area. JC and I located a swarm of deep rock shafts and we are returning quite shortly to conduct further investigation. We had been pointed in this direction by the exploits of cavers from decades past. The majority of our cave discoveries had been from building upon the investigations of others. See my video on some caves beneath the Bruce Peninsula here – video on caving beneath the Bruce Peninsula. 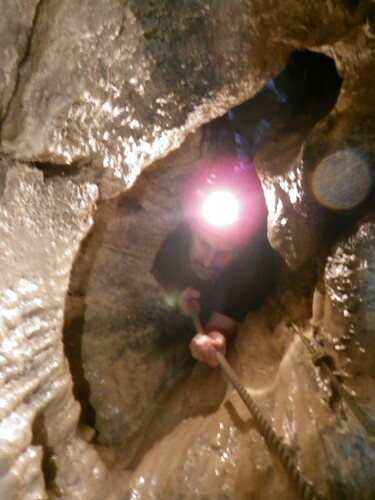 It is here at the very tip of the Niagara Escarpment that Ontario caving is at its very best. And the discoveries of what lies beneath is just beginning. There are countless kilometers of bush and limestone alvars that remain to be explored. As it was a beautiful warm day in early April, JC and I headed up to conduct some further exploration on the Bruce Peninsula. Our intent was to try and locate a stream that we had heard of; apparently this stream drains a sizable plateau and normally flows with at least 10 cubic feet of water a second. Being a plumber JC estimated that a 1 foot high by 2 foot wide pheratic tube might flow with about 4 cubic feet a second, but 10 cubic feet might possibly be human sized, also considering that we have had an especially dry winter so who says that the tunnel will be full of water. An ambitious caver might slither up that worm hole and find bigger passages on beyond that entry portal. Well we never found the stream as we were sidetracked by a visit to a well known local sea cave (see the picture above) and then as we were heading up toward the stream that we had heard of we we were again way-laid by what looked like depressions in the forest. Well one thing led to another and those depressions morphed into incredible solution shafts – several of them grouped together and deep, deep, deep (but that’s another post). We spent the rest of the afternoon assessing the local geography and seeking to understand the situation with all those pits. We are in no doubt as to the possibility of a cave system beneath – the surface features kind of remind me of the sinks and their dispositions around Museum and Leopard Frog Cave, its just that they appear to be totally relic from the ice age and subject to some heavy water pressure beneath a glacier (Museum and Leopard Frog are still obviously recharged with surface running water). More to follow on this exciting new cave possibility (including video). It makes C-Hurst look a lot less impressive for the depth and volume that these new solution shafts encompass.